This weeks Dandy, #3531, has 51 free gifts, if you count every single sticker as a free gift. The other gift is a mystery, I got a water pistol (Hurrah! ), was that the mystery free gift, or are there others? 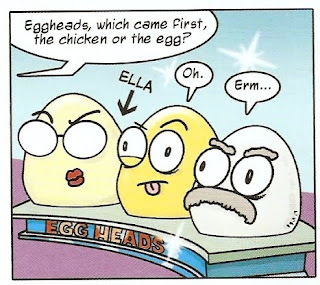 Harry Hill's story this week is all about apples, cramming as many apple jokes as you can into one story! How many did you count (we spotted 6)! Amazing artwork by Nigel Parkinson! 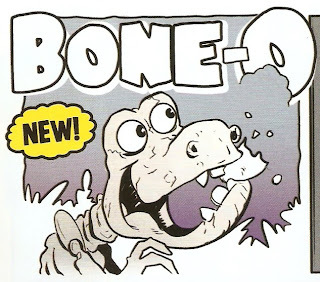 After Bone-o was launched last week, a lot of people are wondering who drew it. Well, this weeks story was signed, revealing that it is drawn by: I was really looking forewards to this weeks Arena of Awesome story, after all, it had so much advertising. But, after all that, it was a let down! In my opinion. So, I decided to spoil it for you and show you part of the last box! Well, here it is! And for this week only, 3 New 'shorts' were inside! 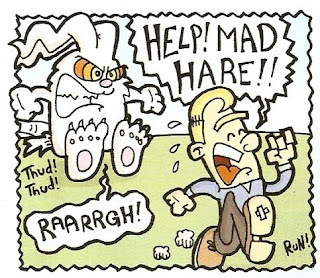 Springwatch and Mad March hare by Andy Fanton, and The Eggheads by Nigel Auchterlounie! Farmula one ends this week to be replaced by, I'm not sure, possibly Thor? As usual, another fantastic Justin Beaver - I couldn't spot Korky this time Stu, but is that Odd ball from Whizzer and Chips and Brassneck in box 8? 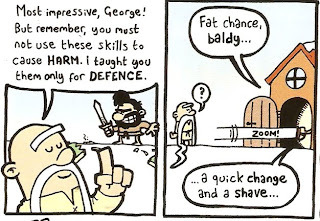 And Dave the squirrel makes another appearence in George vs Dargon! Oh, and yes, that was me who sent that photo to the mailbag! Well, it's now been confirmed! 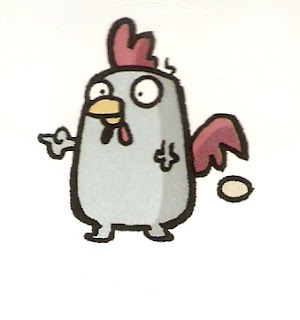 There were many different free gifts, including a Marvo the wonder chicken gun and a Xtreme Splatapult. 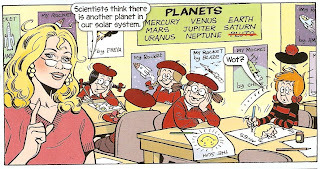 Also, a hidden detail I didn't notice - Brassneck is also hiding somewhere in one of Andy Fanton's comic strips. Minnie the Minx's dad is always refered to as 'Dad', even by Minnies mum. 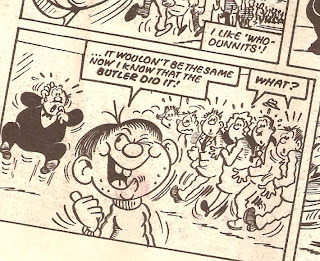 But here, in the 24th March 1979 copy of the Beano, he isn't! Hooray! 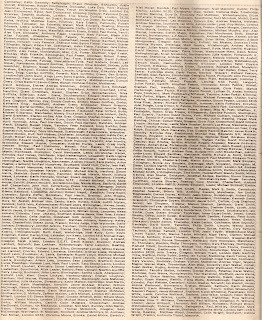 So his real name is....... As always - click on the image, and then again to view in full size! Well done Andy, keep up the good work! 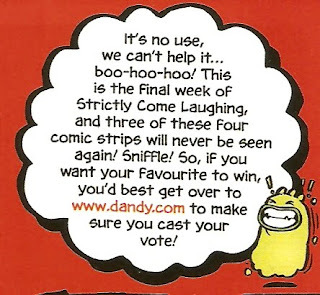 UPDATE - 26/04/2011: Strangely enough, you can still vote! Just a quick blog, revealing the answers of the poll, if you haven't already seen it on the side over there! --> (It's not actually there now!) Anyway, the top result (3 votes) is 1970's - 1980's. Thanks for voting! 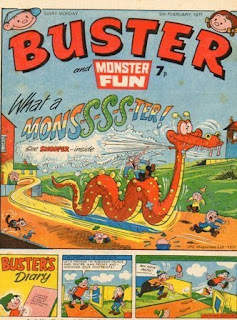 Above: Buster and Monster Fun comic, 5th Febuary 1977. Excellant artowrk of an inflatable Loch Ness Monster (?) 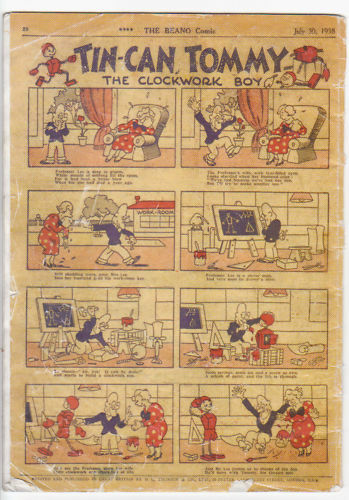 by Leo Baxendale. 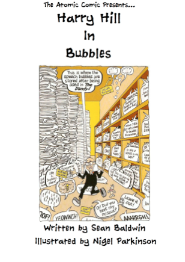 Dandy #3530 is full 'o fun! 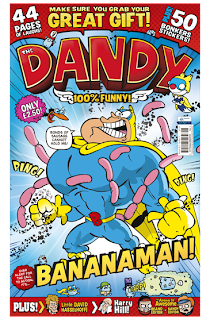 The latest Dandy is out now, with a free set of "snapping teeth"!And 44 pages... but snapping teeth! 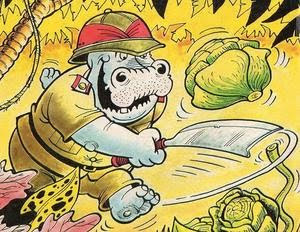 Unlike previous bumper issues this one has a 4 page Bananaman stroy (and it's even continued into next week), drawn by Wayne Thomson. 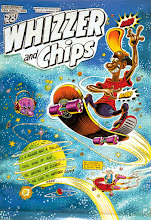 Also, this issue has 4 brilliant new stories, Britian's not got talent, Knock-Knock, The space dogz and Bone-o! 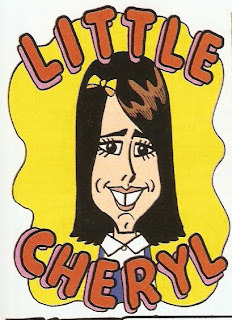 Good to see a little celebrity story again, Little Cheryl this time. Simon Cowell (who features in Jamie Smart's Arena of Awesome as well)wears his trousers up to his armpits, as usual drawn by Nigel. Justin Beaver is better this week, especially the second half. And Stu also put Korky in again! Yey! When I first saw the story advertised I thought it would go like this: Justin is singing, then pest control come along..... (I hope you read this Stu!) 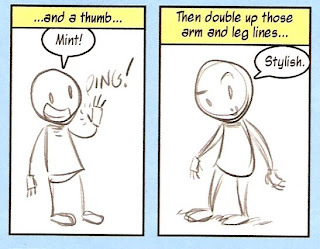 And for the first time in a while a step by step drawing guide in the Dandy, see below. 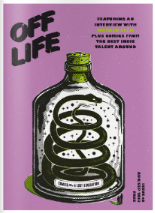 George Vs. Dragon is back! Hooray! Replacing Boo after his 8 week run, George comes back from the Himalayas, with a beard! 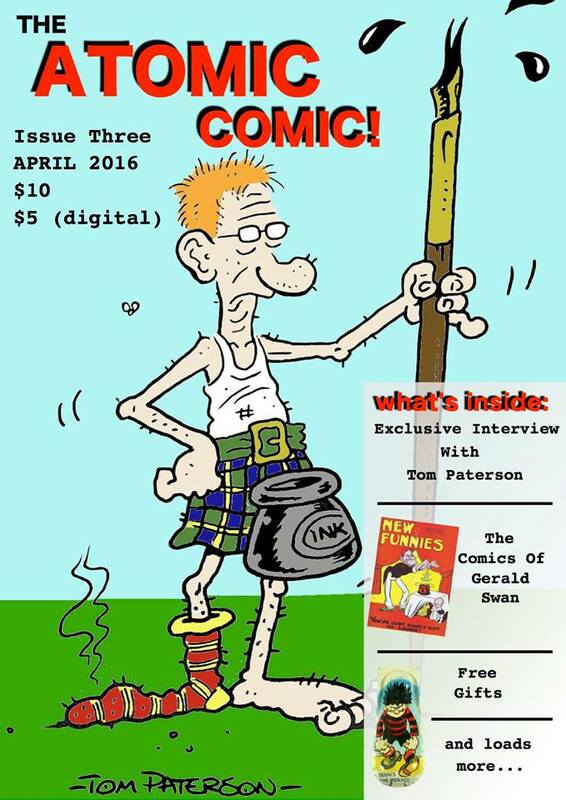 Once again, he hopes to slay that ice-cream eating dragon (see this issue)! Fanton's Grampire only appears once, however. Finally, as readers of this blog would know, I would not like this strip: Until box three, that is! Next week's Dandy is also a 44 pager with two free gifts! Make sure you vote, you have until midnight on 16th. You can vote here! I was just looking through my collection when I noticed this. 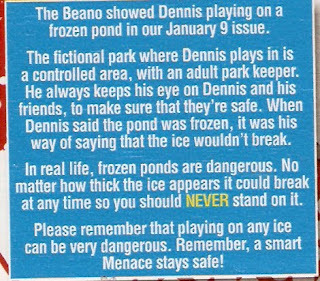 The cover from Beano #3516 (above), showed Dennis and his mates on a frozen duck pond. 4 issues later, the message below turned up on the letters page. On the cover of this issue, however, it shows Dennis climbing up a wall with a couple of plungers stuck to his feet! 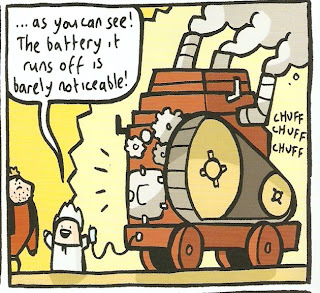 Overall, I quite enjoyed this issue, with Korky the kat in a dustbin in the last panel of Justin Beaver and Desperate Dan moving the town instead of his chair, but there could be one or two improvments. 1.Harry Hill on the cover? I don't think so. Maybe they should put a comic strip there (good to see they've put one on the back cover) or a different comic character. And finally, why is there TWO bananaman strips this week? Didn't they want to make the story go into a third week. It's a good thing to do that, it would make kids (and adults) want to buy it. Although I already knew, next weeks issue is a 44 page bumber special and comes with some gnashing teeth (and it's only £1 more!). I'm looking foreward to Space Dogz as well. Possibly one of my favorite comics in my collection is the one pictured above. 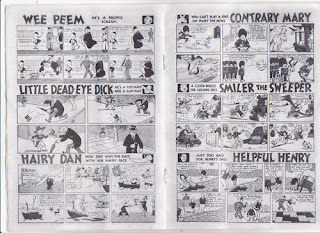 I quite like the paper quality (it feels the same as my Busters from early 1960...), and the contents is brilliant!?! Sweeny Toddler (as always) is causing havoc, this time with a bath! 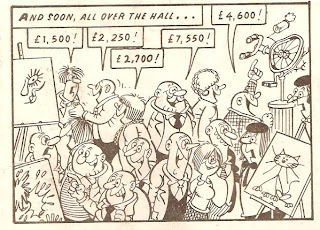 I can't quite tell if that's Tom Paterson art or Leo Baxendale. My guess is Leo. Inside, the Bumpkin Billionaires come up with another money losing scheme, which backfires yet again! This time it's with art, and people buy a load of rubbish, thinking that it's good, because the Bumpkins always make a profit. Art by Mike Lacey, I think. Further on in the comic, a Blabbermouth story drawn by Terry Bave. 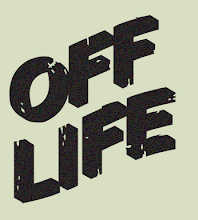 To save money, a cinema gets blabbermouth to watch a film and then go and talk or "blab" about it. All goes well until......... (see box below). Also, I read my first Gal Capone story in this issue, surely this is the same as Pansy Potter?? A good story, none the less! I'm not quite sure why people are trying to kill her. 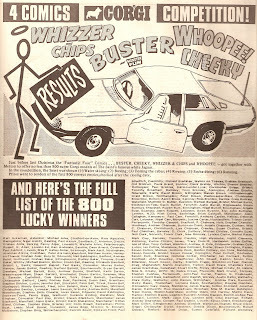 And so, to round off a brilliant comic, here's a list of the 800 winners of the Corgi Car competition, which takes up the centre pages!! Also, I recently bought a "gem" off eBay, the last issue of Big one comic! A post about it will be coming soon - so stay tuned! 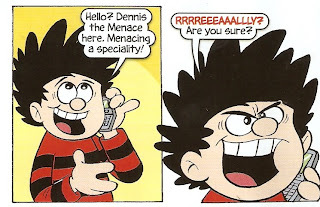 Beano #3580 - What's wrong? The latest issue of The Beano has let us down (and so have I, with that 70's comic I keep promising! 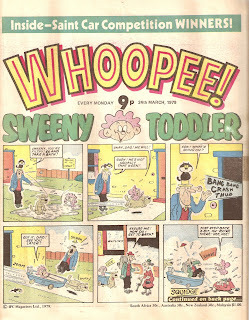 I've finally decided - it's to be a 1979 issue of Whoopee. )First of all - it's £1.50!! And Barak Obama?!?! What is he doing on the cover? Maybe if I read the comic backwards there is some sort of secret message! 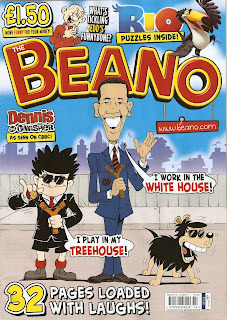 In the Dennis and Gnasher story Obama, obviously, is in it. 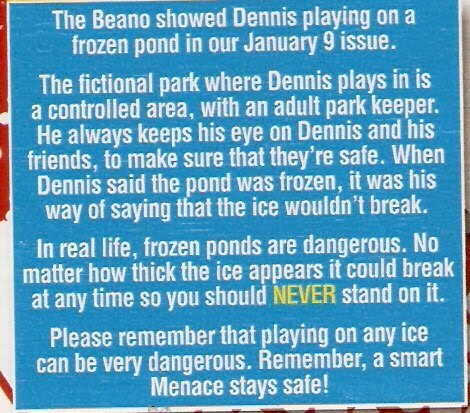 Dennis has a mobile phone (*sigh*) and has to get permission from the American government to menace the president's bodyguards. Surely he should just go out thre and menace them anyway. 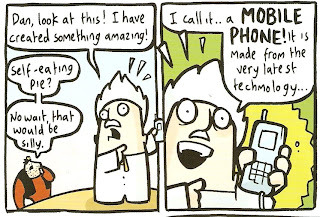 Oh - and get rid of that mobile! 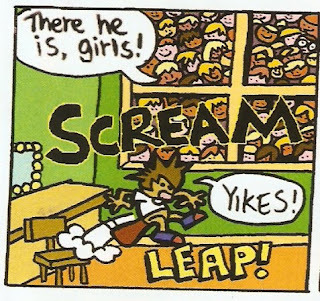 As usual, Meebo and Zuky is a letdown, still thinking that the Cat vs dog thing is a good idea (or maybe I'm just too used to it)... but the Minnie the Minx strip, although it may sound strange - it's actually true! Now were going to zoom over to the centre pages, to the pull-out poster. I'm hardly surprised it wasn't advertised on the cover or even in the previous issue, it's rubbish! It's very pixelated and all the images have just been taken out of previous Beano's and put on top of each other. I can't see many people hanging that on their wall! WARNING! 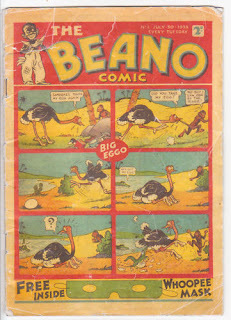 BEANO NO 1 ON EBAY! DON'T BID! 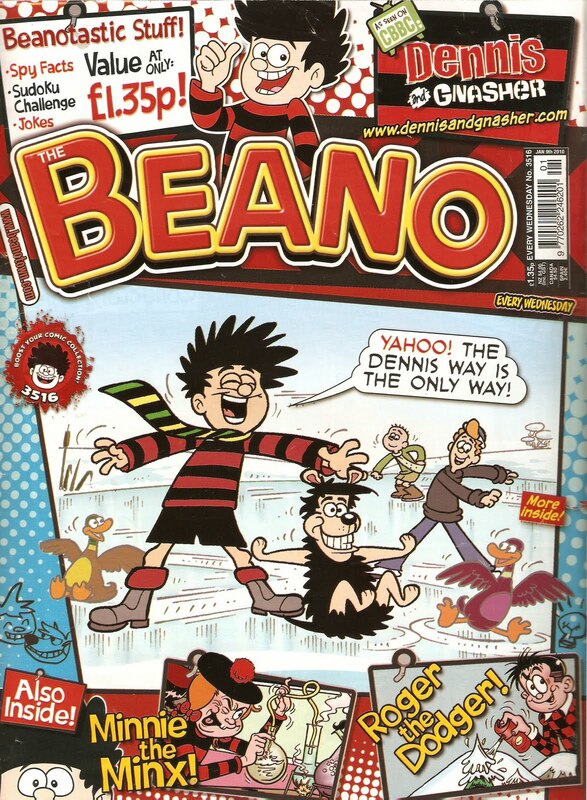 The Beano No. 1 currently up for auction on eBay is a fake, so please don't put in a bid. 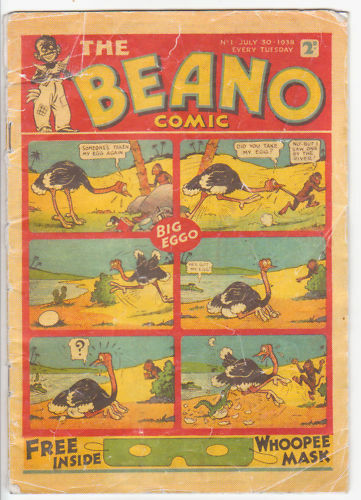 The person who listed the auction has claimed it to be a "genuine Beano issue No.1", but for a few obvious reasons, it is definatly NOT. No.1. My suspicions aroused when I looked at the sellers other items. He doesn't have any. Surely if he had a Beano No.1 he was willing to sell he/she would either be a book seller or he'd found it in his attic during a clearout. He would more than likely have other items listed. 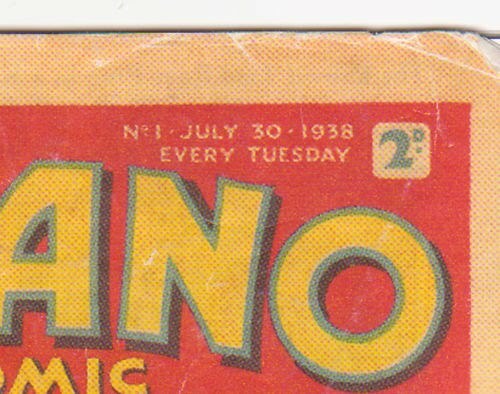 Number 2, the cover has browned whereas the centre pages (above) are perfectly white. WHAT?!? even on the front cover there are many white patches. No way, creases would still be browning from age. There is no way that is going to happen. 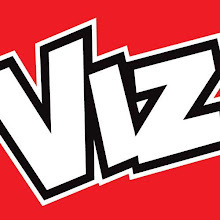 Thirdly, in Beano No 1's the centre pages were printed in blue and red ink, whereas this is black. 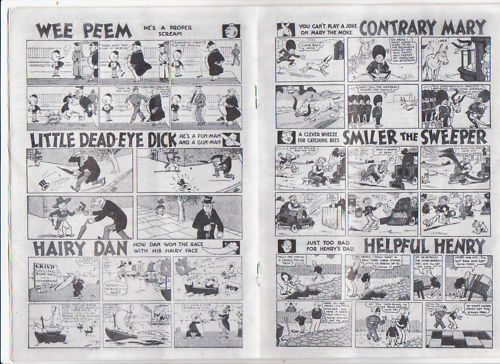 And finally, the beano above has staples. Originals were not printed with staples, and even if they were, they would be very rusty after 70 years. After just a few hours online, the bidding went up to 99.00, with the reserve still not met. Oh dear! Bidders should look at the photos first! So remember - don't bid! Thanks to Lew Stringer for responding to my question and supplying some of the information above. You can visit his blog here! P.s. I know I promised my next blog to be about a comic from the 60's or 70's, but don't fear, it's coming! UPDATE: The auction ended and the comic failed to meet it's reserve price. The bidding only carried up to 360.00, so maybe bidders noticed it wasn't real.